Affordable two-piece overall made of padded 100% waterproof 190T polyamide. 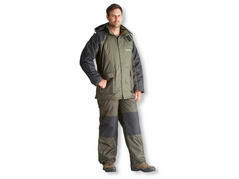 The thermo overall is absolutely waterproof and perfectly thermally insulated. Made of robust nylon fabric, which is PVC coated at the inside. All seams are welded with a sealing strip and thus water-proof, the padding is made of 140g/m² polyester fleece. The jacket features a padded hood. The trousers are extra high-cut for improved heat insulation. 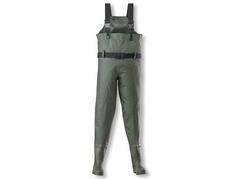 Superior quality, super lightweight chest waders with cleated sole. Delivered with chest bag to store all neccessary accessories. 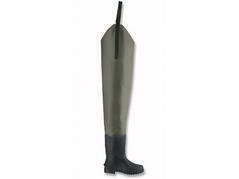 Neoprene chest waders with rubber boots, felt sole in the front and heel made of cleated rubber. 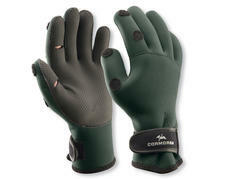 Made of 4mm double coated neoprene and breathable upper part. All seams are taped and 100% waterproof. 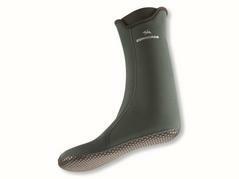 Rubber boots with "Steel Shank" sole are lined with neoprene. 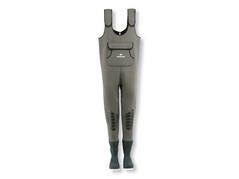 Neoprene chest waders with rubber boots with cleated sole. Made of 4mm double coated neoprene and breathable upper part. All seams are taped and 100% waterproof. Rubber boots with "Steel Shank" sole are lined with neoprene. 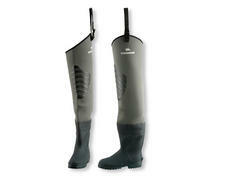 Neoprene hio waders with cleated sole. Made of 4mm double coated neoprene and breathable upper part. All seams are taped and 100% waterproof. Rubber boots with "Steel Shank" sole are lined with neoprene. Lightweight and robust hip waders with cleated sole. 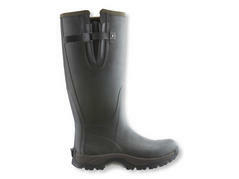 High-end, durable rubber boots made of natural rubber with cotton lining. Within these boots, wearing comfort is most important – the “Steel-Shank” treaded sole is double bolstered to guarantee optimal walking comfort even on bumpy grounds. 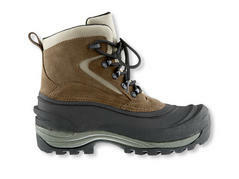 Additionally the strong sole considerably facilitates walking on slippy and marshy ground. The high bootleg has been lined capaciously to offer enough space for strong legs. Long boot socks with anti-slip sole. Very comfortable thermo laced shoe with rough cloddy non-slip rubber sole for particular sure-footedness. The sole construction is waterproof till the rubber belt. With strengthened high-cut toe cap for optimum mobility and protection of the toes. The thick foam padding contributes to optimum thermal comfort. Corrosion resistant smooth running shoe-eyes, strong quick-release hooks and the finger lug facilitate lacing these shoes. Thumb and fingers can be folded back.